PREVIEW: The ebt finals to determine the champions of the 2016 season will be live streamed from Gaeta, Italy beginning on Friday. As the European Beach Tour 2017 gets underway with a number of competitions scheduled for June, the ebt Finals to determine the champions of 2016 are ready to begin in Gaeta. All matches will be streamed live on youtube.com/ehfTV. 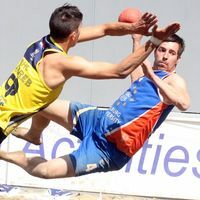 For immediate result updates, the beach handball live ticker is also available. The Italian city will host the finals from 26 to 29 May, where 20 teams will contest the men’s and women’s ebt 2016 titles, with 10 sides competing in each gender. The competition begins with preliminary round matches as the teams fight for semi-final places from two playing groups, after which the top two sides in each group progress. 2016 men’s champions G.A.S. Kilkis Akropolis (GRE) will take to the sand in Group A alongside CBMP Ciudad de Málaga (ESP), TSHV Camelot (NED), BHT Auto Forum Petra Plock (POL) and Os Gordos/Labminho – Clube Naval de Leça (POR). Salgótarjáni Strandépítok BHC (HUN), six-time winners Detono Zagreb (CRO), Russia "Ekaterinodar" (RUS), BHC Beach & Da Gang Münster (GER) and CUS Cassion (ITA) begin their campaigns in Group B. In the women’s competition, defending champions Multichem-Szentendrei N.K.E. (HUN) will meet WBHC Kontesa Nera (CRO), Club Balonmano Playa Algeciras (ESP), SPORT CLUB Senec – Cannabis Energy Drink (SVK) and A.C. Spartacus Goalbet in Group A, while Group B’s line-up includes Westsite Amsterdam (NED), OVB Beach Girls (HUN), KS Red Hot Czili Buk (POL), Beachqueens (SUI) and Figh Futura Roma (ITA). Szentendrei are the top-ranked side in the ebt 2017 women’s competition following official points verification of the first competition of the season, the Jarun Cup in Croatia. Detono Zagreb currently lead the men’s 2017 ranking after they raised the trophy at the home tournament at the end of April.